LYSOFORTE® is a nutritional emulsifier designed to enhance digestion and absorption of energy-rich feed ingredients, including fats, oils and fat-soluble nutrients in livestock and poultry feeds. By optimizing the three steps in fat digestion – emulsification, hydrolysis and absorption – LYSOFORTE provides producers more consistent fat utilization response, enhanced nutrient absorption, improved animal performance and better feed cost control. The primary active ingredient in LYSOFORTE is lysolecithin. Lysolecithin is produced using a patented enzymatic process where soy lecithin is converted into lysophospholipids (LPLs).1 LPLs have increased hydrophilicity and are more fluid, which improves their capacity to support formation of oil-in-water emulsions. The LPLs in LYSOFORTE have unique physical and chemical properties which have been observed to enhance nutrient absorption and improve feed efficiency in multiple species. The mode of action of LYSOFORTE is to enhance digestion and absorption of energy-rich feed ingredients, including fats, oils and fat-soluble nutrients. This helps to maximize feed efficiency and provide feed cost control. Under normal physiological conditions, most dietary fatty acids and fat-soluble nutrients are water insoluble. To be absorbed, these fat-soluble molecules must aggregate to form micelles – a process that requires natural emulsifiers, like bile salts. In the stomach, fatty acids and bile salts interact to form oil-in-water emulsions. Lipase enzymes then hydrolyze the emulsion to release fatty acids. These fatty acids aggregate together to form micelles, which are absorbed by the intestine. LPLs in LYSOFORTE help to improve each step of the fat digestion process. First, LPLs improve the stability of the emulsions in the stomach. Second, LPLs reduce the size of fat droplets. Smaller fat droplets have a larger surface area, which allows for more efficient hydrolysis of fatty acids by lipase enzymes. Third, LPLs reduce the critical micelle concentration. This means micelles form faster and are smaller, making intestinal absorption more efficient. Overall, inclusion of LYSOFORTE reduces the energy needed for fat digestion. This helps to maximize feed efficiency and provide feed cost control. Figure 1. Lysophospholipids (LPLs) in LYSOFORTE increase the efficiency of each step of fat digestion. 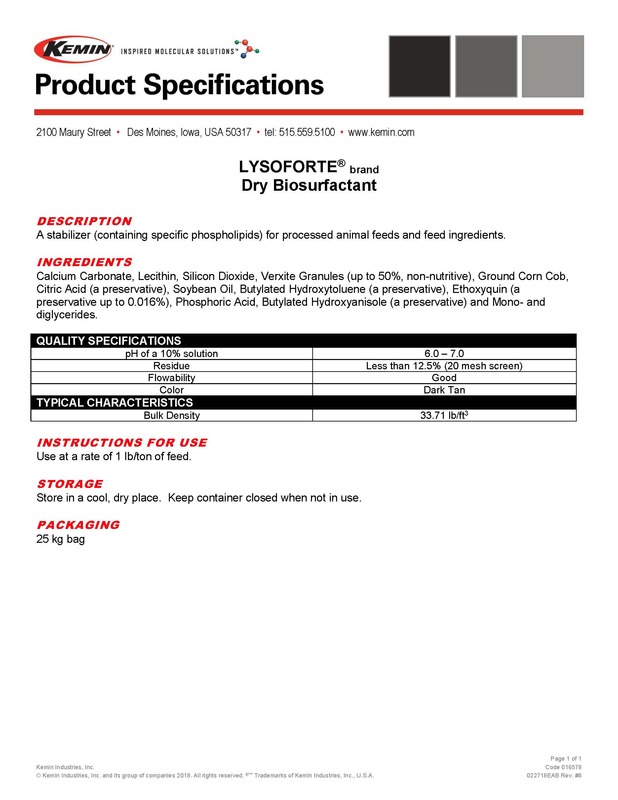 LYSOFORTE is sold in 25 kg bags. Store in a cool, dry place out of direct sunlight for maximum shelf-life. 1Joshi, A., Paratkar, S.G. and Thorat, B.N. 2006. Modification of lecithin by physical, chemical and enzymatic methods. European Journal of Lipid Science and Technology. 108:363-373.